High Wattage for a lower cost. Equipped with hour meter for monitoring usage. 3 Year Consumer Parts Warranty. Only a single 30 amp outlet available. No DC charging and Voltage Meter. 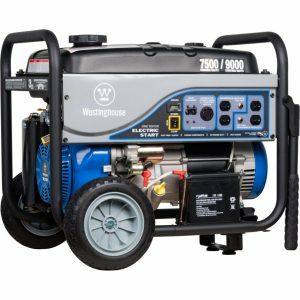 Getting your work done on time and keeping your family safe are both possible with the new Westinghouse WH7500E gas-powered generator, which delivers 7500 running watts of power and a maximum starting output of 9000 watts. Conventional large generators that produce 5000 running watts are able to deliver the rated wattage but are often unable to incorporate a robust design and quality. But, the Westinghouse Portable generator is set apart from standard generators in that it provides various benefits like the one-touch electric start system and an LCD hour meter often found in high-end models. This generator offers enough watts to power most household appliances during a power outage. It features a 420 cc, OHV Engine with EZ start and color-coded starting controls. High performance is guaranteed by the Westinghouse due to the overhead valve design of the engine. The sleeves are made of cast iron and are responsible for the reduction of oil consumption. Additionally, it has forged pistons and connecting rods which give it a highly durable design. On purchase, the unit is fully charged and you only need to install the handle and the wheels. The one-touch electric start powers it on. The engine has a large number of outlets and can power an entire house, workshop or boat. The device has automatic voltage regulation and offers precise voltage control. This feature renders it high reliability. Output voltage regulation is 126 V. The unit is completely enclosed to protect the electrical connections from debris and weather conditions. It has four 120-Volt and one 120/240 Volt twist outlets. The device also has alternator laminations that result in low loss, high efficiency, increase electrical output and decrease fuel consumption to a great extent. It has a cast iron fan guard that facilitates safe operation. A maintenance free bus when excited guarantees, zero down time operation. The package includes a wheel kit, a handle kit, never-flat tyres, oil, funnel and a tool kit. The Westinghouse comes with access to a friendly and highly accessible customer service department along with a 3-year limited manufacture warranty. 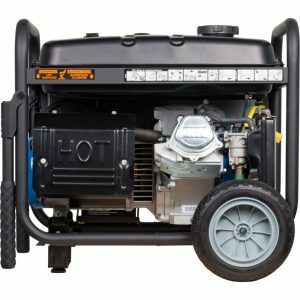 It is one of the few generator models that require low maintenance. The recommended oil type for the Westinghouse is 10W-30. If temperatures drop below zero, a 5W-30 is preferred. Synthetic oil may also be used at occasions. After the first 20 hours of use, the oil needs to be changed. After that, the oil needs to be changed every subsequent 50 hours of usage. Like all portable generators, the Westinghouse is not meant to be run within enclosed spaces. Always place the unit outside. Switch off all tools and appliances connected to the generator. Allow the unit to cool down by letting it run for a few minutes. Turn it off by pressing the ON/OFF button. Shut down the fuel valve. To ensure lifelong smooth operation without repairs, run the unit at least once a month. This will help keep the device in good working condition. The generator must be grounded sufficiently in order to prevent electrocution and ensure safety. Study and follow all possible federal, state and local regulations related to grounding. The recommended transfer switch for the Westinghouse generator is a Westinghouse manufactured model. Most commonly, you will be required to change the generator from a bonded neutral to a floating neutral. The Westinghouse WH7500E, although deemed portable is not very easy to carry around. But it does feel surprisingly compact. The entire unit is approximately 27 inches long by 22 inches high by 20.5 inches wide. The average weight of the device is about 200 pounds which is not particularly light. So unless you have a large RV, this generator is not recommended to be taken for camping trips and the likes. However, it must be noted that there are generators in the market which are much heavier and produce power equal to or lesser than the WH7500E. This model comes with an impressive wheel kit and collapsible wheelbarrow-type for easy rolling from one place to the other. The WH7500E has amazing runtime. This model will work for 12-13 hours at 50% load as opposed to conventional generators that only last for 8-10 hours at half the load. From this data, we can deduce the fantastic fuel efficiency of the device. It has a 6.6 Gallon gas tank. The advanced alternator with specially designed laminations facilitate production of more power with less fuel. Coming to noise generation, this model is one among the quietest generators available in the market. It has an oversized noise reduction Pulse Flo Muffler and a catalyst which renders it a sound level of 71 db. This noise score is suitably well balanced when compared to other standard generators. Thus, we can arrive at the conclusion that this generator is a fairly low-noise model. The WH7500E, although less portable makes up by its ability to power a large number of appliances. This is the preferred generator for emergency situations like large power outages and storms. 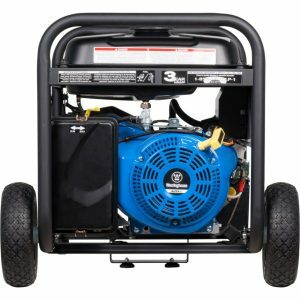 The dependability and easy electric start of this generator are some of its top features. Highly versatile and reliable, this generator has earned a definite 5 star rating from consumers.